When you absolutely positively have to have it there tomorrow, and when "it" is about a quarter of a million pounds of stuff, who do you call? The Russians, of course. The USAF Air Mobility Command is depending on Russian Anotov An-124 charters to move their cargo around, averaging three flights a week in FY2006. For that matter, a European consortium has a three year agreement for two An-124s on full-time charter, two on six day notice, and two on 9 day notice, and have committed to using the aircraft for 2000 hours a year. 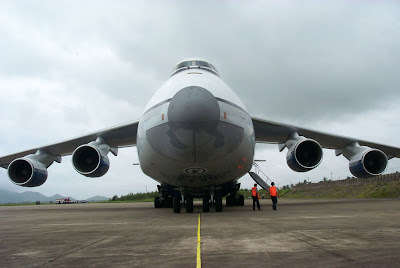 The An-124 has a gross weight just under 1,000,000 pounds, and payload of 330,750 pounds. Here's one swallowing the fuselage of a Navy EP-3, the one that was damaged by an over unenthusiastic Chinese fighter pilot off Hinan Island afew years ago.